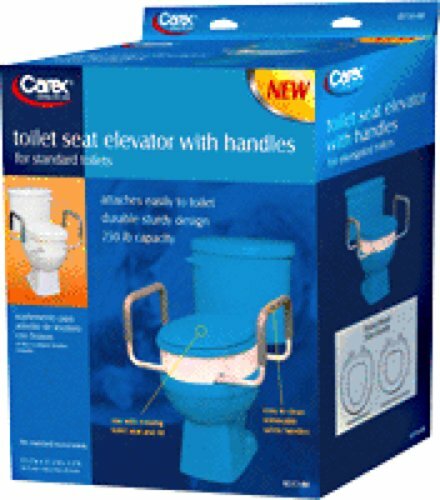 Carex Toilet Seat Elevator with Handles for Standard/Round Toilets, 3-1/2" (10" with Handles) H x 17-1/3" W x 13-1/2" (21-1/2" with Handles)" D, Height Adjust: 3-1/2" -Case of 2 Each. Product is manufacturered and licensed by Carex . Product is categorized as a bathroom safety toilet seat risers. HCPCS: E0244 . Carex Toilet Seat Elevator with Handles for Standard/Round Toilets, 3-1/2" (10" with Handles) H x 17-1/3" W x 13-1/2" (21-1/2" with Handles)" D, Height Adjust: 3-1/2". The Toilet Seat Elevator with Handles for Standard/Round Toilets provides additional stability, safety and comfort to the user. Fits with existing elongated toilet seat and lid. Elevates your existing toilet seat 3-1/2". Sturdy and strong handles for extra support. Handles are padded and are easy to clean with Hypalon grips. Durable design for a long lasting product. Attachment screws are included to provide for a secure base. If you have any questions about this product by Carex Corp, contact us by completing and submitting the form below. If you are looking for a specif part number, please include it with your message.